Spooky AI behavior teaches us a few things about our own interaction with them. 1. Alexa is always listening. This should probably go without saying. One of the most promising — but also, arguably, disconcerting — realities of AI in mobile devices and the Internet of Things is that they are always on. This is partly so AI assistants and other AI-powered applications can readily respond to a user’s queries. The other purpose is to allow the AI’s machine learning algorithms to learn continuously, allowing them to perform better. Perhaps it’s good to be reminded of this by a bodiless laughter from time to time. 2. Machines aren’t perfect. Yet. That point about AI needing to continually learn actually proves a second important reality: Machines, no matter how intelligent they seem, are still far from perfect. 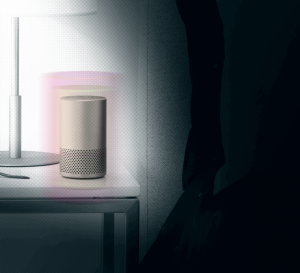 For a virtual AI like Alexa, human interaction boils down to receiving and processing a voice prompt, and echoing a pre-programmed response. Somewhere in between, the device or the AI can still “mishear” the prompts, as Amazon said in their statement. What’s more, mishearing voice commands is a fault not unique only to Alexa. As AI assistants grow more sophisticated, they’ll likely grow better and better at understanding what we want — yet at the end of the day, there will always be a risk something gets lost in translation. 3. Machines can be creepy. Ok, let’s admit it. Machines doing human-like activities can be creepy. The uncanny valley can be as real as it gets when it comes to AI-powered machines, and will likely factor into future design choices. For some, it’s no laughing matter. 4. Unplug. You need it. It’s a bit amusing that, despite the ubiquitous nature of devices like the Amazon Echo, it took unsolicited laughter to make users unplug. Given how much we depend on today’s gadgets and devices, we tend to forget that it’s alright to disconnect once in a while. Sure, technology is definitely useful, but it doesn’t hurt to not need it every so often. At the very least, it’ll keep you from worrying about your virtual assistant laughing at a joke only it could hear.